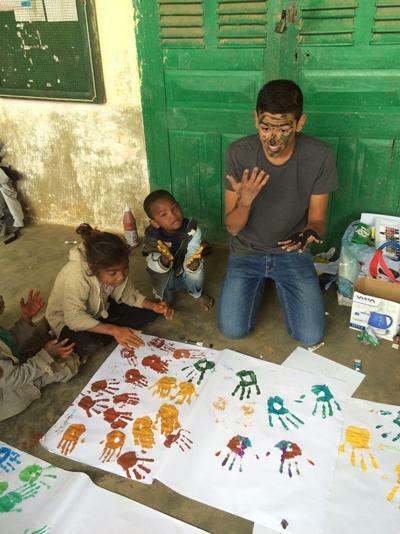 By volunteering with Projects Abroad on a Care Project in Madagascar, you will provide disadvantaged children with the early childhood development they need. In Madagascar, many children have very low literacy and numeracy levels, and therefore struggle when they start school in first grade. By joining this project you will contribute to our goals to help children reach a level high enough to cope with the normal schooling system. Whether you are on a gap year, career break, or looking for a meaningful experience during your vacation, you will make an impact and your efforts will be greatly appreciated in the community. Our Care placements are based in the town of Andasibe, a small town with a population of 12,000 people. While on the Care Project in Madagascar, you will work at the Projects Abroad Early Childhood Development Centre, attended by children between the ages 2 and 6 whose parents cannot afford to send them to pre-school. The centre is funded and run by Projects Abroad, and relies entirely on the work done by volunteers. The children do not have another centre or school to go to, so without volunteer support we cannot provide them with the important care they receive at the centre. At the centre, you will run educational activities related to teaching basic literacy, numeracy, English, and French, which are part of our Care Management Plan goals. You are also welcome to introduce other activities, such as sport and arts and crafts. In addition to teaching, you will also have many opportunities to introduce children to healthy hygiene habits such as washing hands and brushing teeth. If you volunteer during the Madagascar school break from early July to the end of September, you will help run a camp for primary school children between the ages of 6 to 11. The camp is filled with educational activities to keep the children stimulated during their long break. Whether you are helping children learn to read, playing sports with them, or teaching them a new game, the time and attention you give them will be hugely beneficial. The camp is also open for children younger than 6 years who will receive early childhood development focus. You can read more detailed information about the aims of the project in our Madagascar Care Management Plan. Social development, friendship, and emotional support are the key things you can offer as a volunteer. Most volunteers work from Monday to Friday and have the weekends free to travel and explore. Once a week, you will attend a weekly workshop with a Projects Abroad coordinator. During these workshops, you will discuss lesson plans for the next week, the challenges you have faced, and together come up with solutions. Projects Abroad is happy to provide extra help to volunteers working on Care Projects. This may include buying some paints or art materials or arranging a day where all the volunteers in Madagascar help to renovate a play area at a school. Suggestions from volunteers are welcomed and we are open to any ideas you may have to help improve the lives of the children with whom you are working. You can join a Care Project in Madagascar for two or three weeks if you don't have time to join us for four weeks or more. This project has been selected by our local colleagues as being suitable for short term volunteering for both the host community and the volunteer. Although you will gain a valuable cultural insight and work intensely within the local community please be aware that you may not be able to make the same impact as someone volunteering for a longer period. While you’re in Madagascar, you might also consider joining a 1 week Conservation & Environment Project. For more information, please visit our Rainforest Conservation Project in Madagascar page. Our Combinations Page explains how you can combine not only projects, but also destinations."